The rearview mirror has evolved slowly over time. Nowadays, there are glare-reducing options, day/night mirrors, wider viewing angles, embedded compasses or even OnStar service built-in. Japanese car-maker Nissan wants to redefine this important piece of car equipment by introducing the new Smart Rearview Mirror. The Smart Rearview Mirror looks like any rearview mirror but with the flip of a switch turns into a display screen. 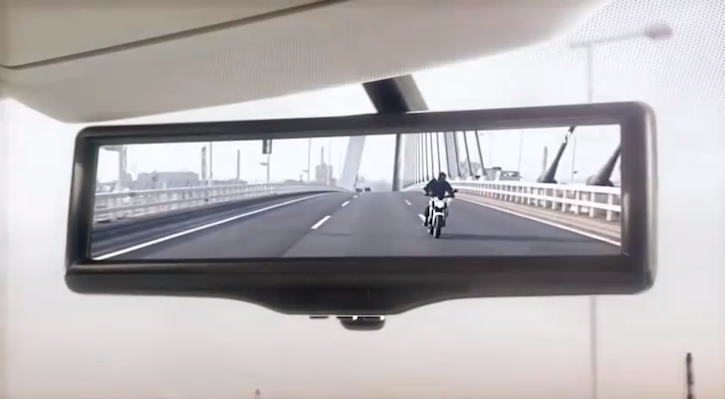 The screen displays the view behind your car from a rearview camera. Nissan plans on launching the product globally by 2015 but there maybe a hitch in getting it approved in the United States. While Japanese customers may be able to get the Smart Rearview Mirror installed by their dealers as early as Spring this year, American customers may never see the product hit the markets. The reason being, driving laws in this country. Currently, it is illegal to operate a video screen in front of the driver's headrest while the vehicle is in forward motion. The Smart Rearview Mirror would violate this law. We will have to wait and see if Nissan has plans of introducing the accessory in the US. If it does, it will take a few changes to the existing laws. Seems like quite a stretch.